Alpacas were domesticated by preInca people over 6,000 years ago. The Inca Empire lasted from 1438 until the arrival of he Spanish in 1532. To the Incas, status and wealth were counted in cloth, most of it coming from the alpaca. Clothes made of their luxury fiber (hair) were once worn by the Incan Sun Kings. Alpacas are still kept in herds that graze the central highlands of the Andes at an altitude of 11,500 ft. to 16,000 ft., mostly in southern Peru , but also in northern Bolivia, and northern Chile. Over 93% of the world’s 4 million+ alpacas (2014) are found in this region and a little more than 4% are in the U.S. The first major importation of alpacas into the U.S. occurred in 1984. 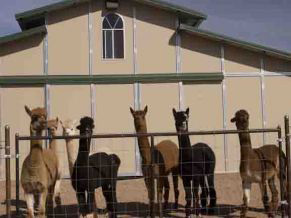 Now (2014), there are 182,899 registered alpacas in the U.S. on about 15,000 farms or ranches. The alpaca is truly one of nature’s most beautiful creatures. Like all animals, alpacas exhibit individual personalities but are generally gentle, curious, and respond well to children. Some will come nose-to-nose with you and sniff. They normally live from 15 to 20 years, have an average height of 36 inches at the shoulders, and generally weigh from 100 to 200 pounds. Alpaca fiber comes in 22 different colors. There are two types of alpacas, classified according to their fiber type. About 82% of the alpacas in the U.S. are Huacayas. The other 18% are Suris. Huacaya fiber is soft, dense, and crimpy (waves in the hair). It grows perpendicular to the body which gives the alpaca a fluffy and round appearance. Suri fiber is lustrous, silky, no crimp, and grows parallel to the body in long, separate locks. Both are considered luxury fibers in the textile industry. Alpaca fiber is light-weight, warm, durable, soft, and not itchy. Therefore, it is used for making knitted and woven items such as rugs, blankets (Pendleton), sweaters, coats, socks, hats, gloves, and scarves. The designer Armani uses alpaca yarn to make various types of men’s and women’s clothing.